First and foremost is that you have a deep and strong love for Jesus Christ. If you have that, then you will also understand and believe that our masters are the poor – that we serve Jesus by serving the poor for it is Jesus who tells us Blessed Are The Poor. It is a circle, one leads to the other and then back to the first. Where is the I, the me in this circle? It is not there – one must be willing to give up oneself to serve the poor and the needy, no matter where they are. Our work is to heal the physical, emotional and spiritual scars of the poor – we wash the feet of the poor as Jesus heals them. Many women in mid life or later find themselves longing for something more in their lives. While the heart is searching, listening for a call, the head is saying I want to do something good, something important, with the rest of my years. 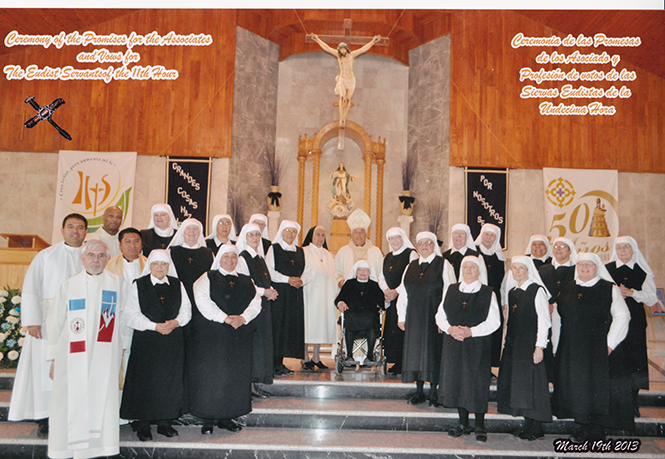 The Eudist Servants Of The Eleventh Hour offer these women an opportunity to follow a vocation later in life – a kind of “encore” dedicated to Our Lord. When candidates are accepted by the community, they are invited to spend nine months at Casa Corazon de Maria, in Tijuana, Mexico. This is a period of discernment and formation, before entering full time ministry or considering the profession of vows. We make and renew our vows of poverty, chastity, obedience and divine agape, on March 25 each year, the Feast of the Annunciation Of The Blessed Virgin Mary Servant candidates should be between the ages of 45 to 65. But there are always some exceptions. The Eudist Servants Of The Eleventh Hour is made up of mature women who were called to a religious life later in life. All members must be self-supporting and provide for their own health care. Whenever that is not possible we try to assist. We do not always live in common and we do not draw from a common fund. We are self-caring in that we provide for our own personal needs and contribute to the needs of our missions, as individual circumstances allow. If you meet these criteria, then becoming a Eudist Servant Of The Eleventh Hour may be appropriate for you.